QRRI FLEXGARD® Interlocking Flooring products can be configured to a wide variety of layouts. Easily create a new floor from scratch, or add to existing floor setups for expanded coverage. Each tile interlocks on all four sides, enabling quick and simple installation. They are equipped with a textured surface finish to increase traction, reducing the risk of slip and fall. QRRI FLEXGARD® Punter® Top Interlocking Tile is a highly durable, all-rubber flooring solution. 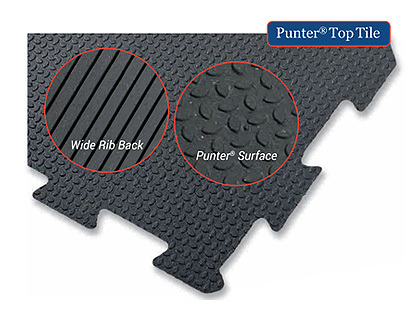 The proprietary Punter® Top surface finish provides excellent traction, while the FLEXGARD® 100% rubber material absorbs shock and impact. The tiles have a wide rib finish on the back, allowing better air flow. Increased air circulation reduces condensation buildup; a common issue that can lead to unhygienic conditions. QRRI FLEXGARD® Tru-Lite® Interlocking Mat is a versatile flooring option suited for a variety of applications. Tru-Lite® mats are fabricated from EVA (Ethylene Vinyl Acetate); a closed-cell foam that is durable and high density. EVA is a resilient yet lightweight material, making product transportation and storage easier and less costly. The surface finish is an unobtrusive, slightly textured pattern which increases traction and improves slip resistance. 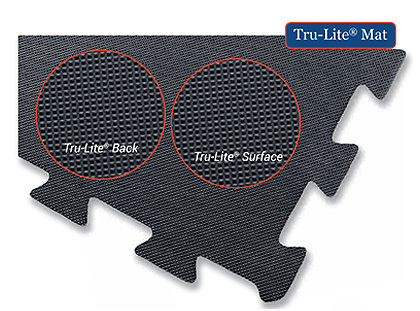 Tru-Lite® Interlocking Mat can be used to create a clean, quiet, and soft workout area for any floor or gym. It can also be used as a portable stall mat for convenience. Give your horses a safe, comfortable environment and save on cost and effort with Tru-Lite® Interlocking Mat.